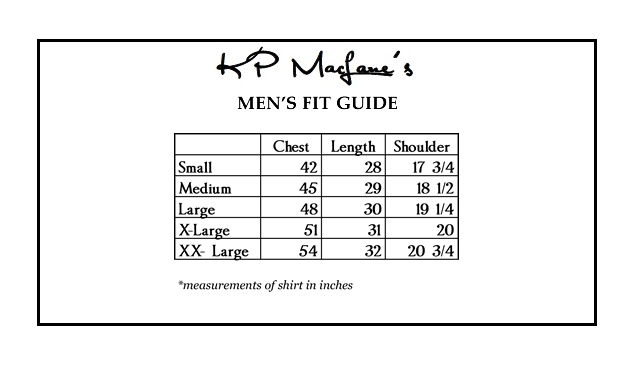 The measurements on our size chart (see below) refer to the actual measurements of the shirt, and not of the wearer. An easy way to determine your size is to measure a shirt you currently own and compare (in inches) to our size chart to determine the best fit for you. How do I purchase a KP MacLane product? You can purchase from our website by visiting our ‘SHOP‘ page. We accept payment from Mastercard, Visa, American Express and Discover issued in the United States. We do not accept international credit cards at this time. You may also visit our ‘PLACES’ page to see where we are sold. Yes. During the checkout process, please check the box that indicates you are sending a gift. We will not include a paper receipt if you choose this option. You may type a message in the box provided. The recipient will receive a hand-written note with their gift. Click here to be directed to the gift card page. Will you add more colors and products to your line? Wash in warm water with like colors. Do not place in the dryer. Lay flat to dry, reshape and smooth out any wrinkles with your hands. We like to fold over the collar and fasten all buttons to help keep it crisp. The entire process should take no more than a few minutes. You may also dry clean. Our bird was inspired by the wild parrots of San Francisco, where the company was founded.